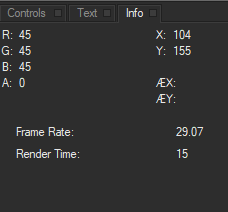 The Frame Rate and estimated Render Time for the effect. R, G, B, and A display the values in the four color channels (Blue, Green, Blue, and Alpha, respectively) of the pixel at the cursor location. If the cursor is outside of the composite image, these values do not update. X and Y display the X and Y coordinates of the cursor position, measured in pixels from the upper-left corner of the composite image. The X and Y values are displayed when the cursor is placed anywhere inside the Composite window. The maximum size of these values is determined by the frame size of your project. Frame Rate displays the current frame rate in frames per second. 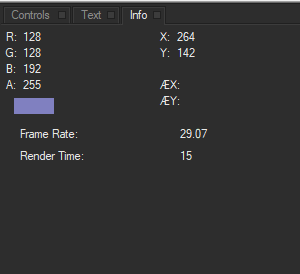 Render Time displays the time, in milliseconds, required to render the current frame. It is important to note that working with the Info Window open can slow your playback performance and it is recomended that you close the window when you are not using it.